It's Sunday and normally this is the day when Paul and I would head to the grocery to stock up on our veggies, meat and favorite canned goods. Since I've been flying back and forth from Manila to Singapore though, our kitchen cabinet is still well-stocked with bottled fishes and canned meats thanks to the regular care packages that we'd get from both my mom and my MIL. That said, we have been frequenting the grocery much lesser for these past few months. Let me share with you one yummy find that I got from Manila. Meet Super Tuyo! While it may not be a superhero character, it's yummines can definitely qualify for some gourmet superhero qualities. I received these bottles a few months ago and I was so excited to bring it back as Paul is really a big fan of tuyo (dried herring). He loves it so much that he can happily enjoy a meal with just a generous amount of tuyo swimming in a pool of spicy Sinamak vinegar, fried egg and steamed white rice. I'm lucky that my hubby is not a picky eater and he doesn't mind simple dishes too. 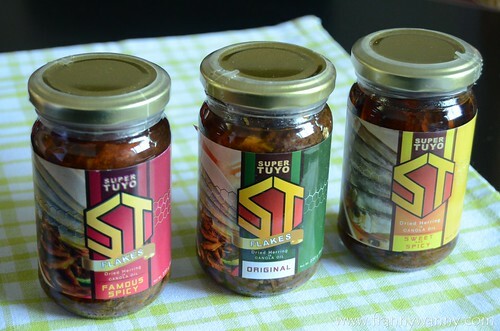 Anyway, Super Tuyo comes in 3 flavors -- Original, Famous Spicy and Sweet & Spicy. It is available in different serving sizes too from the easy to carry Super Pack to the 200g regular bottle and the 460g jumbo bottle. It's amazing that they have a lot of variety and options provided for their consumers. Now, when it comes to the taste. We tried the Sweet & Spicy first as Paul wanted it hot while I wanted it mild. This is a good compromise for couples like us as it has a spicy kick followed by a light sweet note. It was surprisingly good! Even after trying all three flavors, I liked this the most. The Original was a bit too salty for my liking as there wasn't any other herbs or spices to balance it out. The Famous Spicy came in as 2nd place as it has a strong spicy kick but still bearable enough that it won't fully numb your taste buds and ruining your meal all together. By the way, these regular Super Tuyo bottles use Canola Oil which isn't so bad. However, if you want to go healthy, they actually have a Super Tuyo Gourmet line which makes use of Olive Oil and it comes in 250g bottles giving you an extra 50g serving. 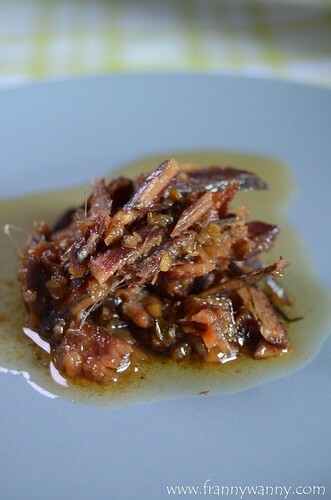 There are so many ways to include Super Tuyo in your everyday cooking. So far we've enjoyed it with aglio olio pasta, homemade fried rice, mixed it inside an omelet and of course, having it on it's own with fried egg and garlic rice a.k.a. TuSiLog (heehee). I was also able to read about Super Tuyo's interesting history (showbiz fans, you have to read this!). I'm really for supporting locally-made goods and of course, the local Philippine businesses. At the moment, Super Tuyo has a very limited distribution network as it's not sold in any of the major supermarkets yet but do check out this list to see where's the nearest store to you.